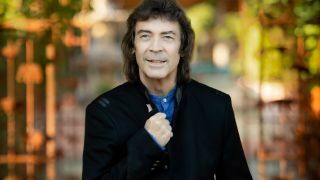 Steve Hackett has released a video for his new single Beasts In Our Time. It’s the latest material taken from his upcoming studio album At The Edge Of Light, which will launch next Friday (January 25) on CD, 2LP/CD, on digital platforms and as a Mediabook CD/DVD, which will contain 5.1 surround sound mix and a behind-the-scenes documentary. Hackett says: “Beasts In Our Time is the main thrust of this album, exposing fear, greed and intolerance. The eagle in the video symbolises the hatred and violence which nationalism breeds… and the clown, deceptive, destructive forces which masquerade as fun and innocuous. Hackett previously released the tracks Under The Eye Of The Sun and Underground Railroad from the follow-up to 2017’s The Night Siren. The guitarist will head out on the road later this year on the latest leg of the Genesis Revisited tour. The November shows will see Hackett play Selling England By The Pound in full and he’ll also perform a selection of tracks from 1979’s Spectral Mornings to celebrate its 40th anniversary.